1. How long had you been having foot and Plantar Fasciitis problems? I have been working in the retail field since the late 90's. I have been having foot pain since then but my dr didn't think anything of it besides working long hours standing in one spot most of the day/night. By the end of my shift normally 6-8 hours I could barely walk and by the time i made it home after my feet tightening up from the drive home i was in tears. I don't remember much about it. I decided to use a wheelchair instead of crutches because crutches and I don't get along. I had mine in may of 2008 and I am still in pain. I am not working and haven't been since the surgery. I also lost our insurance right after the stitches came out so that might be part of the reason why i am still in pain. But it seems like the pain has moved to all over my foot. when I walk it feels like my toes are about to break off(you know that cramped feeling like u need to pop them to make them feel better but u cant)my heel hurts to the touch. My arch hurts when i go grocery shopping and i have been tempted to get my walking boots out again just to get me though my grocery shopping. My achilles tendon has also begun hurting within the last 6 months. 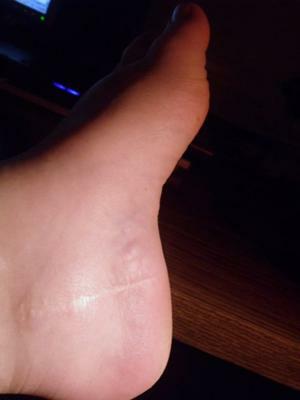 I am uploading a picture of my ankle right now showing how swollen it stays and the scar form my surgery. I am also supposed to have the surgery again on my right foot. Thanks for adding the pictures, and all the details. You're in a world of hurt with your post surgery Plantar Fasciitis. One of the problems with surgery is that Tendonitis of any kind does not exist in just one single spot. It consists of the entire limb, the lower leg, the foot, muscle and connective tissue and nervous system. Just getting in and cutting on one spot isn't likely to help, and is highly likely to mess your foot up even more (as you may be experiencing). You need to make the structure of your foot STRONGER, not cut it up and make it weaker and looser. I highly suggest that you get my 'The Plantar Fasciitis Treatment That Works' DVD and the companion ebook that comes with it. My free 'tips' are to start ice dipping as described on the How To Reduce Inflammation page. Make sure you understand how the Process of Inflammation works. Get your Vitamin D level up between 50-80. Understand Magnesium for Tendonitis and supplement appropriately. Im on wk two after my surgery getting stitches out today. My pre surgery diagnosis was all wrong where as most ppl tendon muscle n nerves are side by side in your foot mine where stacked on top of each other causing pain basically standing on my nerve n compressing the tunnel. I'm so affraid to stand on it after stitches come out and praying this surgery fixed the problem. I had surgery October 6th for plantar fasciitis, a heel spur and tarsal tunnel in my left foot. Apparently the nerves and ligaments were so tight that they never would've resolved on their own. I returned to work last week (2 months after surgery) and have been having a lot of pain, mostly the top of the foot and arch. The surgeon figured the pain on top of my foot was bc of the tarsal tunnel but after doing an ultrasound it turns out I have tendinitis. Thanks for the advice. The link you provided is not working. Thanks for letting me know! Just fixed it. I had foot pain for seven months prior to surgery. The pain was at a point where walking was difficult. I had a plantar fasciotomy and tarsal tunnel release six months ago. I was non-weight bearing for three weeks and in a boot for another two. Recovery was initially slow with one step forward and two steps back. However, I seemed to be making progress at the three or four month mark. Sadly, over the past month, I have started having a sharp pain in my heel and a dull ache on my outside ankle. My doctor adjusted my orthotic which has helped the dull ache, but he is attributing the sharp pain to nerve pain. He had said there is not much that can be done other than giving me meds so that it is easier to sleep. I am very frustrated by this and am looking for any advice, ideas, or options. For now, I will keep working my rehab. Well, the bad news is, you permanently altered the structural integrity of the load bearing structures and overall mechanism of your foot. But, you're at where you're at, so the question is, how to best go forward. Your doctor has no answers like he had no good explanation of why the plantar fascia was the cause of the problem and how cutting it would fix anything. 1. You have a lot of acute/chronic inflammation process in the area. 2. Your body has to adjust to the new/different structural function/dysfuncion that now exists in the foot. 3. All the factors that caused the foot pain in the first place are still in place and conspiring against you. So you need to reduce inflammation (which will also reduce pain), you need to allow some time getting your new foot structure/mechanism into as-good-as-it-can-adapt state, and you would be well served by reversing the tendonitis dynamic (inflammation, tightness, nutritional lack) that got you to the foot pain in the first place as is likely worse post-surgery. Since you're in a serious situation (and 'tips or tricks' isn't going to get you the results you want), and I'm presuming you're motivated to recover as well and as quickly as possible, I would get to work with The Plantar Fasciitis Treatment That Works program, it will show you how to do all of the above. Had both procedures done to left foot due to severe pain and all non surgical methods had helped. I am a nurse and on my feet 12 hrs a day. After surgery 5 weeks yesterday..my heel is still numb and to bear weight just brings tears to my eyes. My doctor isn't being very helpful. Tarsal Tunnel, Plantar Fasciitis and heel spur removal. First started having pain 2009, but didn't think it was anything major. I walk for a living so I just though I was over doing it. By December of 09 I couldn't take the pain, so I attempted to get help from my job, but to no avail I ended up really screwed. Loss of pay etc. Went back to work after that little rest, but by 2013 I was in pain so severally I was working with no shoes, taking extra breaks, I mean literally delivering mail in socks in my apartment complexes. I then looked for help from a new doctor. They helped me though the red tape, OWCP and getting help. I found out that a had a heel spur in my right foot so big they thought it was a bone tumor. I've had 5 MRI'S 6 xrays and at first DOL OWCP and THE P.O. though I and the doctors were making it up. I had 4 trips to have a series of injections 4 in each foot everytime. Placed in therapy and sent back to work. Eventually, a second opinion doctor did a EMG nerve test to discover that I had TARSAL TUNNEL two different types anterior and posterior WOW. PLANTAR Factiitis and bone spurs in each feet. Sweet joy, a diagnosis. So finally I had surgery on my right foot first mind you 5 years later. Still in bed......a little mobile but both my feet get tired out easy just going to the restroom. This contraption my right feet is in is extremely difficult. Idk if I wanna do the next one.......I pray my foot heals good so I can consider doing to second. How's the one foot doing post-surgery now? How you recovered will effect how I answer your question, so give me an update and we'll go from there. In mid April of 2012 i woke up to a pain in my lower left foot, didn't know what it was. It was worse stepping out of bed in the morning. I found out it was pf the next month. This came about because i started going to the gym in Feb of 2012 and using the treadmill. For 2 months i just did a slow walk- flat. In early April, i started doing an incline for 5 minutes- less than a week later, i had pf. It was only 5 mins a handful of times. In May i was given a steroid shot and a sleeping brace but quickly found out they don't work from doing research. Sure enough- nothing. I had surgery in OCT, 34 days ago, and i still have pf, i know this because i feel it, a couple of mins ago ,waking up, the foot was the same as before. It is more dull, but it is there. I would like to know how surgery does not cure pf. I have no other problems, no bone spurs or anything. The primary answer to your question of 'why does plantar fasciitis not cure plantar fasciitis' likes in the fact that surgery in no way beneficially affect the various factors that cause plantar fasciitis. If you had asked your doctor WHY you had plantar fasciitis symptoms, s/he would not have said 'because of muscle and connective tissue tightness in the lower leg, because of chronic inflammation, because of nutritional insufficiency all working together to cause pain and problem'. What your doctors DID tell was that 'Cutting into your foot will magically fix the problem (even though we don't actually know what the problem is)'. Having said that, some people feel better after surgery. Hopefully you'll be one of them. My struggle with PF began when I was participating in a moderate running regamin last summer. It started with all the classic symptoms and progressed to unbearability. After almost a year of trying all the "conservative" modalities as well as cortisone injections (4), night splints, cam boot, PT, custom insoles, etc. I elected to have the surgery on 9 Aug. The surgery was done laparoscopically and I was non-weight bearing for almost three weeks. After that, I was in a cam boot for several weeks then my sneaker and going to physical therapy three times a week. I take 1-2 Vicodin twice a day as well as valtorin (oral and topical). Last week I was started on the H wave machine due to severe burning and pain around my incision as well as the bottom of my foot (where I had the pain from the PF). It now feels as though my ankle is broken (in addition to the continued pain that resembles the pain of my PF at its worst). I am a female, 5'7, about 180 (yep, gained 20 lbs) and at my wits end. My job and well-being depend on my mobility. I am not sure what do next. Any advice will be valued. Thank you. Ouch. No fun at all. It's been a few months since you wrote this. I'm predicting it hasn't really gotten much better. True/False? So, what to do now? Go back to the basics and hit them hard. You had Plantar Fasciitis symptoms and tarsal tunnel syndrome symptoms. Surgery ignored the causes, didn't fix the problem, and looks to have made things worse. The goal now is to lower pain levels and improve the ecology of the entire lower leg structure as much as possible. That's totally possible, depending on how much damage the surgery did. You need a complete plan of attack. I suggest either the Plantar Fasciitis DVD (up on the right) or the Reversing Achilles Tendonitis ebook (also up on the rightt). You've got to eliminate the chronic inflammation that's working in there, reverse the Pain Causing Dynamic, loosen too tight muscle and connective tissue which will also allow those structures to better work/compensate for any structures the surgeon cut/severed, and correct any nutritional insufficiency/deficiency. Give me an update on what's happened since you wrote this, and we'll go from there.